There’s nothing better than a really good cookie. Usually when I want one I make Chocolate Chip. Because I love a classic cookie with bits of melty bittersweet chocolate, hepatitis crisp on the outside and chewy on the inside. It’s the kind of thing that makes the world a better place and exactly what I wanted Sunday afternoon. So I raided the fridge and pantry to see if I had everything I needed. I didn’t. 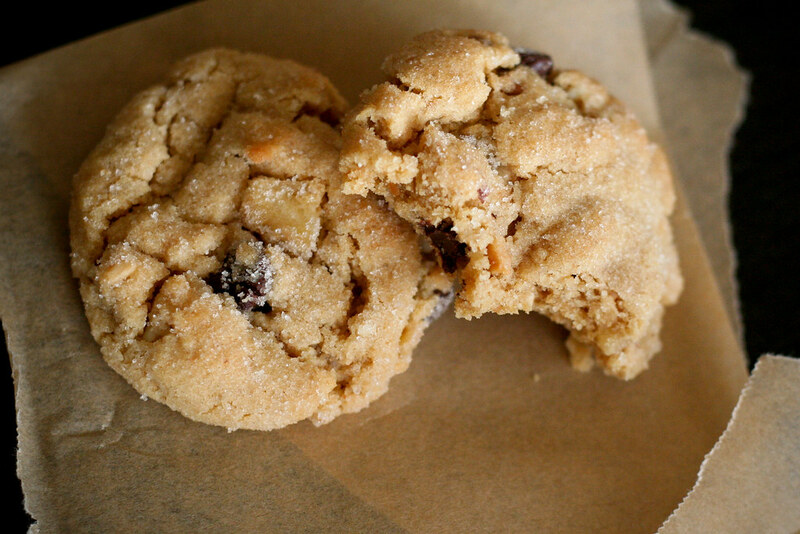 After a few minutes of internet searching, stuff I found Smitten Kitchen’s Peanut Butter Cookies and – score! – I had almost all of the ingredients. The only thing I was missing was peanut butter chips. I was just going to use more chocolate chips, but then I spotted some dried banana chips in the pantry. Banana, peanut butter and chocolate can never be wrong together. I knew these would be good. Really good. Classic Chocolate Chip Cookie good. And they were! The banana chips gave the cookies a slight crunch and subtle banana flavor. Not the overpowering taste of ripe bananas you get with banana bread, but even better with the crunchy/salty peanut butter. And of course, chocolate chips make everything better. These have got to be some of my favorite cookies of all time. I know they’ll be the ones I bring to the beach this summer. 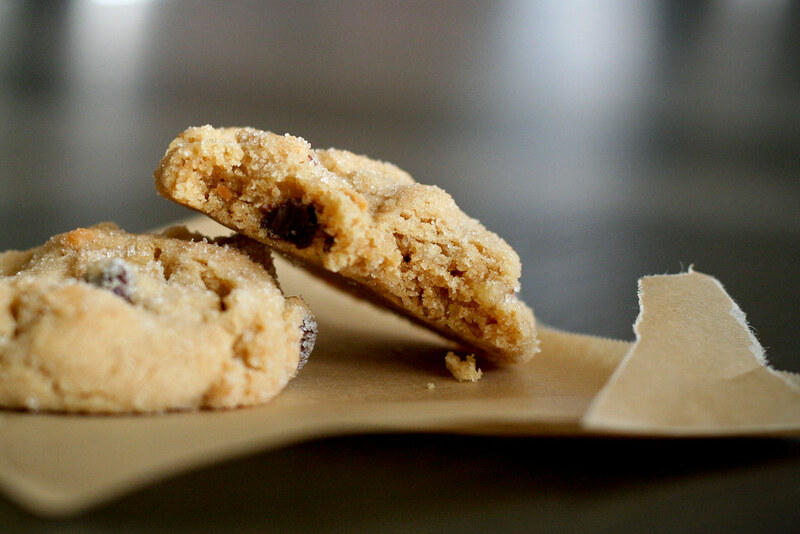 If you love peanut butter and banana, this is the cookie for you. I froze half the batter and am so glad I did. Otherwise I’d have to go buy some bigger pants. Instead of all white flour, I used mostly whole wheat pasty flour. I also substituted the light brown sugar for Demerara and the white sugar for natural cane sugar. Also, the peanut butter chips for coarsely chopped banana chips. In a large bowl, beat the butter and the peanut butter together until fluffy. Add the sugars and beat until smooth. Add the egg and mix well. Add the milk and the vanilla extract. Add the flour mixture and beat thoroughly. Stir in the banana and chocolate chips. Place sprinkling sugar â€” the remaining tablespoon â€” on a plate. Drop by rounded teaspoonfuls into the sugar, then onto ungreased cookie sheets, leaving several inches between for expansion. Using a fork, lightly indent with a crisss-cross pattern (I used the back of a small offset spatula to keep it smooth on top), but do not overly flatten cookies. Bake for 10 to 12 minutes. Do not overbake. Cookies may appear to be underdone, but they are not. dang! i have all these ingredients…i better get to work because these look amaaazing! Just made these, I like the banana chips. I had never bought them, before I made your power bar recipe, and I have to say I like baking with them, but I don’t like them plain. Oh, I had been experimenting with different health bars, did 101 cookbooks, Elena’s Pantry gluten free, a couple hybrids, and yours (not all at once of course). Yours got the top vote from my hubby! All of my favorites in one cookie! These were so good! So easy to make and delicious! Have I been living under a rock? Banana chips in a cookie! Brilliant! I’d give these a five on a scale of one to ten. It was very hard to taste the banana flavor of the banana chips. Also, the texture was too powdery for my taste. The peanut butter and chocolate was a good combo. I’d like tto see more posts like this .